A power strip (also known as an extension block, power board, power bar, plug board, trailing gang, trailing socket, trailer lead and by many other variations) is a block of electrical sockets that attaches to the end of a flexible cable (typically with a mains plug on the other end), allowing multiple electrical devices to be powered from a single electrical socket. Power strips are often used when many electrical devices are in proximity, such as for audio, video, computer systems, appliances, power tools, and lighting. 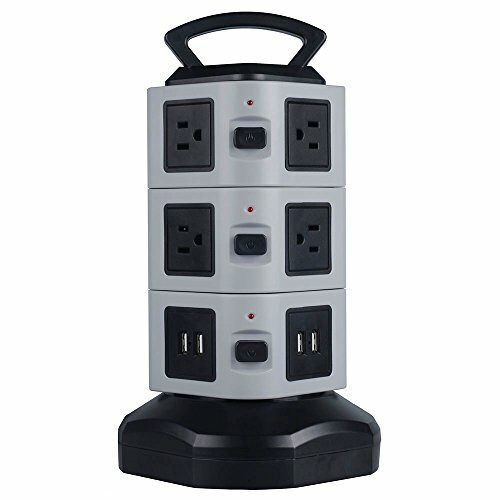 This power strip tower supports 110-250V worldwide voltage power strip with 6 feet power cord suitable for home office travel.